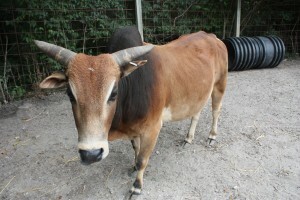 There are 75 breeds of zebus in Africa and South China. They are well suited for tropical environments. Zebus have humps on their shoulders, dewlaps under their chins, and droopy ears. The male and female dwarf zebus at Scovill Zoo can be found in the petting zoo. African pygmy goats are in our petting zoo area. They are the smaller goats running around with the kids (human and goats). When having young, goats often have twins; once in a while they have triplets. Goats, in general, are used for their milk, their meat, and their hides. When humans are allergic to cow milk, goat’s milk is an alternative. The goat milk also makes a very distinctive flavored cheese.